Have you ever tried to send multiple websites’ links to your counterparts or friends either through emails or Instant Messaging? Instead of sending them all the links separately, you may want to consider this simple online solution that makes the life easier. Named as 1link, it helps to consolidate all the websites’ links under a single master link so that the recipients will only need to click on the single link to open all the individual links embedded into it. The process is very simple. Users just need to go to 1link and enter all the desired links into the blank box, with one link per line. Users can enter as many links as possible but one thing to note here is when the recipients receive and click on the master link, it will launch all the links and just to make sure you don’t create unnecessary trouble by sending too many links at a single time to mess up their desktop screen. 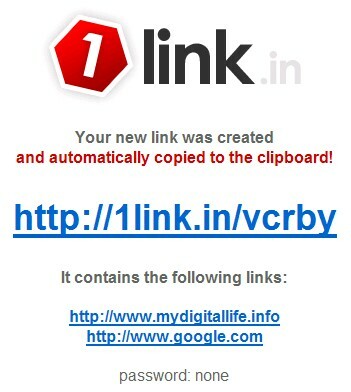 Once completed, just click on ‘1Link’ and it will generate a master link that is ready to be sent out immediately. Good thing is, users can set up password to prevent those links from reaching unintended recipients. The online service is totally free of charge and doesn’t even require any registration and users can start using it immediately.